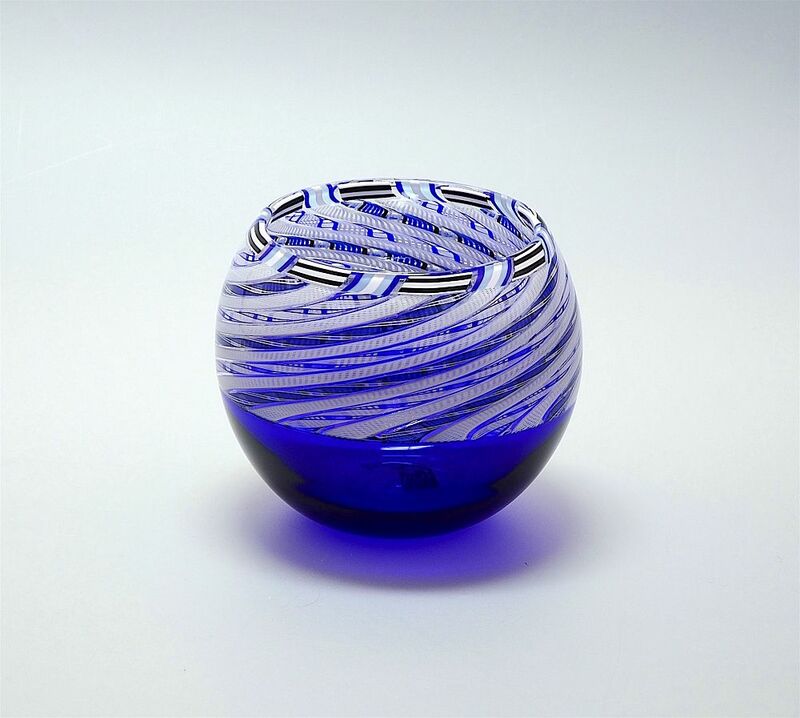 This is a lovely bowl which was made by Michael Hunter for Twists Glass in 2016 and is also a new design. The dark blue incalmo base supports 24 zanfirico canes , 12 in white, 6 in blue black & white and 6 in white & blue, alternating white, blue black & white, white, blue & white, white etc. The zanfirico canes swirl around the top of the bowl to an incalmo edge comprising 16 alternating tessera canes, 8 in blue, pale blue & white and 8 in black & white, the blue tessera canes laid vertically and the black and white tessera canes laid horizontally. The base is scratch signed "M Hunter Twists 16" and has the Twists Glass studio label.